Hurricane Michael will be just a memory by Saturday and Sunday, but as it leaves the Outer Banks it’s dragging some awesome weather behind it. Actually by the time it gets to the Outer Banks, it will be Tropical Storm Michael and after looking at every weather forecast we can find, it looks as though Thursday and early morning Friday are going to be wet and windy days, but nothing that would raise concerns on the Outer Banks. What that means is for anyone who had plans for the upcoming weekend, don’t change those plans. The big event of this coming weekend is the Saturday and Sunday Mustang Rock & Roast, combining great music with food. It’s hard to imagine anything wrong with that combination. It creates a great day of music. This year though, Mike is taking it one step farther by combining fun food with the festival. Saturday its steamed oysters—that’s the Rock—and Sunday there’s a barbecue showdown. That’s the Roast. The headliners for the festival, Big Something on Saturday and Pink Talking Fish on Sunday will be capping two days of great music. And the weather will make this an even better event, with daytime temperature hovering around 70 and bright sunshine. Proceeds from the Mustang Rock & Roast supports two fantastic causes—the Corolla Wild Horse Fund and the Mustang Outreach program that helps to supplement the music programs in local schools, teaching kids about music and performance. 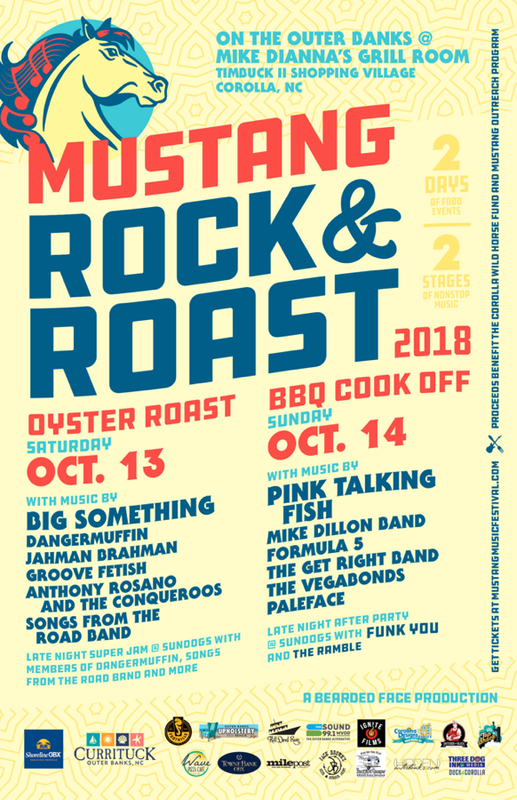 The Mustang Rock & Roast is just one of a number of great fall events on the Outer Banks. Joe Lamb, Jr. & Associates has the perfect accommodations and great rates for an autumn getaway.